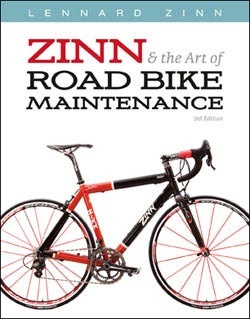 The new Zinn & the Art of Road Bike Maintenance is here! Newly updated to include the latest tech in cycling, Zinn & the Art of Road Bike Maintenance is the best organized and illustrated guide to maintaining a bicycle. The book is now available in bookstores, bike shops, and online. Zinn & the Art of Road Bike Maintenance has become one of the world's best-selling books on bicycle care. This smartly organized and clearly illustrated guide-now in 2 colors for easier reference-can make a mechanic out of anyone. Lennard Zinn's expert advice turns road bike maintenance, repair, and upgrades into quick work. With Zinn's book anyone can properly maintain, tune, fix, or upgrade a bicycle to ensure years of trouble-free riding. Newcomers and experienced mechanics alike will benefit from hundreds of illustrations, exploded views of how components go together, and Zinn's practical, time-saving tips. Zinn's friendly advice is confidence-inspiring, and his years of experience make tackling even the most daunting task fun and easy. The basics: For those whose mechanical skills stop at pumping tires, Zinn's guidance will demonstrate how to maintain a bike in perfect condition. The advanced: Zinn has time-saving tips to speed work on difficult tasks. Zinn covers integrated spindle cranks, carbon forks, internal headsets, ceramic bearings, and more with exploded diagrams to show the way. The latest tech: Zinn explores the ins and outs of the newest components including: Campagnolo's 11-speed, Shimano's electronic Dura-Ace, SRAM's Red shifters, Campagnolo's Ultra-Torque cranks, and more. Older components: Zinn's years of experience help cyclists make sense of old metal. Cyclocross: New cyclocross-specific information throughout, along with more pro tips, more illustrations, more recommendations - more of what you need to know. Zinn & the Art of Road Bike Maintenance, 3rd Ed. 2-color charts, tables throughout. B&w illustrations throughout. Lennard Zinn is one of the world's leading authorities on bicycle repair. A master frame builder and an enthusiastic rider and mechanic, Zinn is also a technical writer for VeloNews magazine. Zinn is the bestselling author of Zinn & the Art of Mountain Bike Maintenance and producer of a 4-hour instructional DVD of the same title. Zinn is also author of Zinn & the Art of Triathlon Bikes, Zinn's Cycling Primer, The Mountain Bike Performance Handbook, and The Mountain Bike Owner's Manual. VeloPress is an endurance sports and fitness publisher with books on cycling, triathlon, running, swimming, yoga, nutrition, and the histories and personalities of our sports. VeloPress is the book publishing division of Competitor Group, Inc., publisher of VeloNews, Triathlete, Inside Triathlon, and Competitor magazines and producer of the Rock 'N' Roll marathon and half-marathon series and the Muddy Buddy adventure series.